Keeping your inventory data accurate and consistent across all channels is critical to your marketing efforts and reputation. It starts with getting your inventory data, photos, and descriptions into your Auction123 Dashboard in the most effective manner. We work with you to determine the best method to obtain and update your inventory data on an automated schedule. Once imported or manually built, you will have total control over your vehicles’ information from within the Auction123 system. 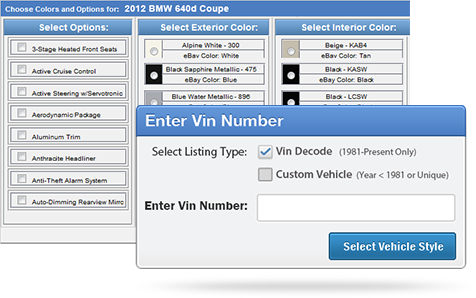 Auction123 has been managing car dealer imports and offering VIN decoding solutions since 2001. Our internal system of checks and balances ensures your inventory will always be up-to-date and accurate. All auto dealers will benefit from our data management whether they have 5 cars or 15 rooftops. We support many large dealership groups in processing even the most complex inventory import and management requests. We can import your automotive inventory from nearly any source that is able to send a file. Determine if you want us to get the raw data from polling your DMS; the images, descriptions, and videos within your current service provider; or drop us a file of your inventory via FTP. We can setup your automated import for as often as you need your inventory refreshed in our system. Auction123 offers certified integration with Reynolds & Reynolds ERA® DMS and AutoSoft's FLEX DMS. 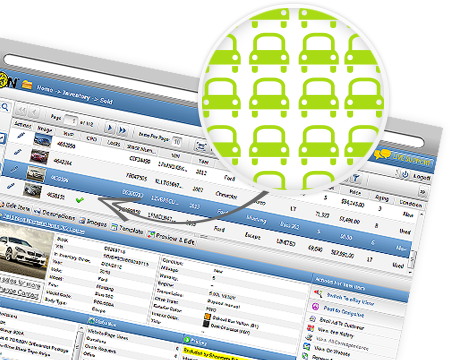 Manually entering and maintaining your vehicle inventory is a snap with the Auction123 inventory management system. When building a car or truck, our Enhanced VIN Decoder will automatically populate OEM specifications and features along with all available options for that specific year, make, model, and trim level on any vehicle 1981 or newer. Newer model vehicles will populate about 150 – 200 points of automotive data. 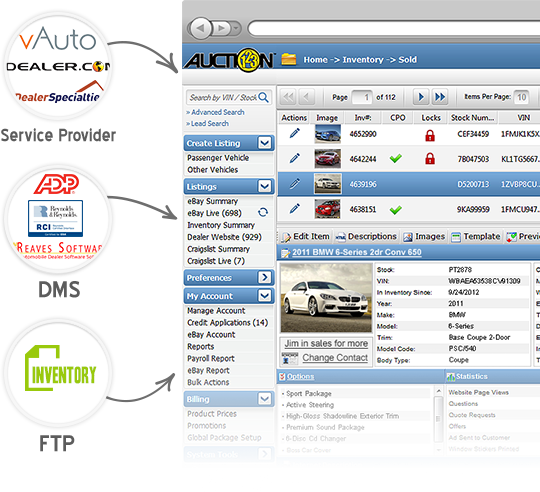 The Auction123 system offers the best tools for importing franchise and independent auto dealer inventory. 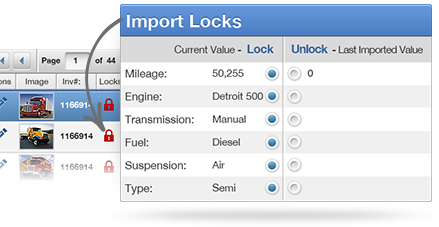 Our Field Level Locking controls let you edit and lock a data point on a vehicle (i.e. Internet price) while all other data points of the vehicle continue to update from the import. Revert to the imported value at any time by unlocking the data point. Having a sale on BMWs? Our Bulk Actions system allows you to edit pricing (or revert changes) on your inventory. Our import features are the perfect match for Dealer Groups who require unique filters, splits, or combinations of inventory from one or many sources. Auction123 provides RV dealers with comprehensive solutions for presenting all the important unit features quickly and easily in a clean presentation. By incorporating RV and Camper model data with the Auction123 inventory management system, RV dealers can be confident they are providing their shoppers, and search engines, with all the information necessary to make an informed purchasing decision. We can import RV and Camper inventory from nearly any source that is able to send a file. Determine if you want us to get the raw data from your DMS; the images, descriptions, and videos within your current service provider; or drop us a file of your inventory via FTP. We can setup your automated import for as often as you need your inventory refreshed in our system. 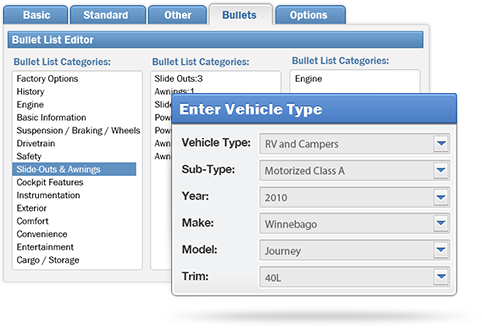 Manually build detailed RV and Camper listings in seconds with our integrated RV model data. Available for units 2008 or newer, the enhanced data will be populated based on the year, make (manufacturer), model (brand), and trim (style). Display up to 150 specifications including information about the entertainment features, instrumentation, living area amenities, and more. Auction123 system will automatically append a stock image and floor plan to the listing when available. 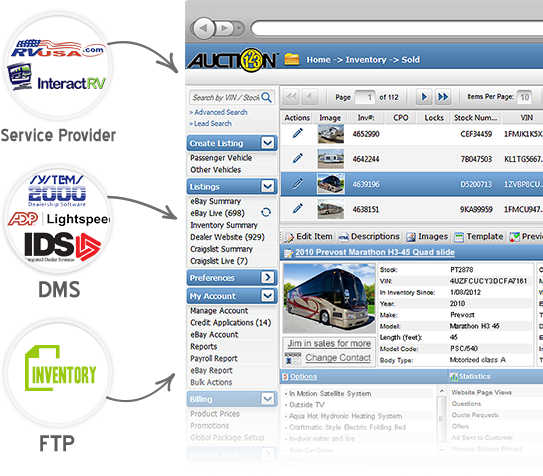 The Auction123 system offers the best tools for importing franchise and independent RV and Camper dealer inventory. 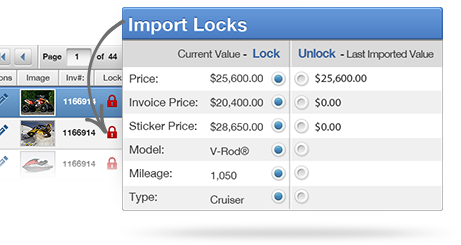 Our Field Level Locking controls let you edit and lock a data point on a vehicle (i.e. Internet price) while all other data points of the vehicle continue to update from the import. Revert to the imported value at any time by unlocking the data point. Having a sale on Forest Rivers? Our Bulk Actions system allows you to edit pricing (or revert changes) on your inventory. Our import features are the perfect match for Dealer Groups who require unique filters, splits, or combinations of inventory from one or many sources. Auction123’s Powersports and Motorcycle inventory management tools are one of the best in the industry. We power some of the most successful Harley-Davidson and Polaris dealers in the country. From integrated motorcycle and powersports inventory data to our fully automated import processes, rest assured we’ve got you covered. We can import Motorcycle and Powersports dealer inventory from nearly any source that is able to send a file. Determine if you want us to get the raw data from your DMS; the images, descriptions, and videos within your current service provider; or drop us a file of your inventory via FTP. We can setup your automated import for as often as you need your inventory refreshed in our system. 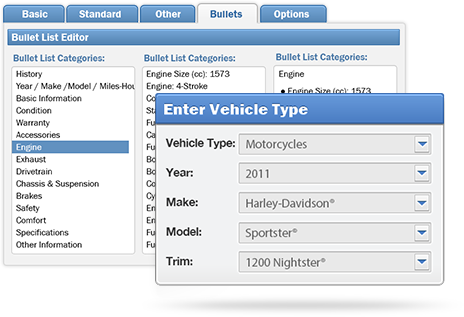 Build your motorcycle and powersports listings packed with OEM features in seconds via our integrated model data. Available for units 2004 or newer, the enhanced data will be populated based on the year, make, model, and trim. Display up to 150 specifications including information about the engine, weight, suspension, and more. Auction123 system will automatically append a stock image to the listing when available. The Auction123 system offers the best tools for importing franchise and independent powersports and motorcycle dealer inventory. 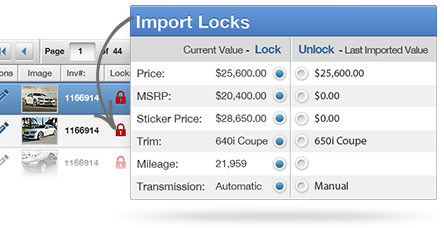 Our Field Level Locking controls let you edit and lock a data point on a vehicle (i.e. Internet price) while all other data points of the vehicle continue to update from the import. Revert to the imported value at any time by unlocking the data point. Having a sale on Suzukis? Our Bulk Actions system allows you to edit pricing (or revert changes) on your inventory. Our import features are the perfect match for Dealer Groups who require unique filters, splits, or combinations of inventory from one or many sources. Auction123’s Marine dealer inventory management tools are some of the most advanced solutions available to the boating dealer industry. Build your marine inventory into your Auction123 dashboard or let us import your inventory file from your current service provider. You’ve never seen a more advanced and easy-to-use Marine dealer inventory system than ours. We can import boat and marine inventory from nearly any source that is able to send a file. Determine if you want us to get the raw data from your DMS; the images, descriptions, and videos within your current service provider; or drop us a file of your inventory via FTP. We can setup your automated import for as often as you need your inventory refreshed in our system. Manually building marine inventory via the Auction123 dashboard ensures your listings will display detailed information beyond just the standard specifications. Our system presents a variety of options including information regarding the interior, hull, galley, engine, and more. 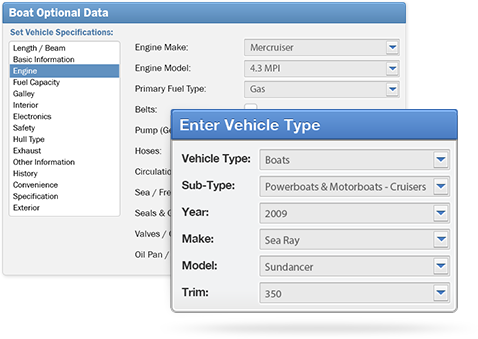 Just select the features of your inventory and your boat listings will be rich with content. The Auction123 system offers the best tools for importing and managing franchise and independent marine dealer inventory. 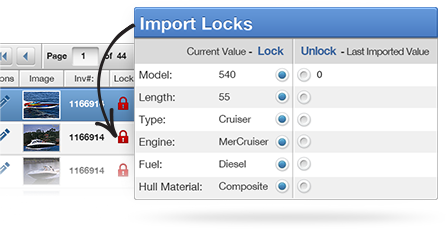 Our Field Level Locking controls let you edit and lock a data point on a vehicle (i.e. Internet price) while all other data points of the vehicle continue to update from the import. Revert to the imported value at any time by unlocking the data point. Having a sale on Sea Ray Sundancers? Our Bulk Actions system allows you to edit pricing (or revert changes) on your inventory. Our import features are the perfect match for Dealer Groups who require unique filters, splits, or combinations of inventory from one or many sources. 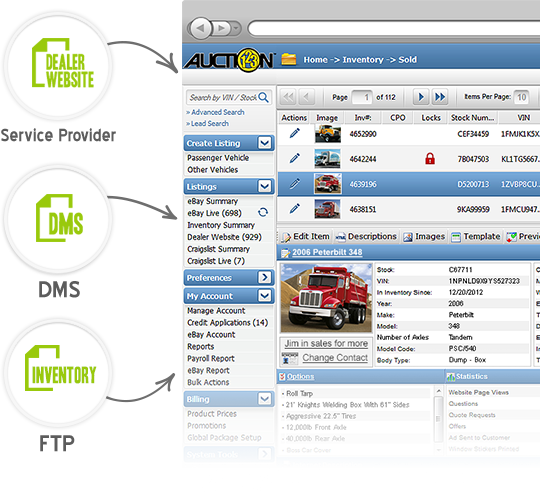 Auction123’s Commercial Truck dealer inventory management tools provide simple and easy solutions to build, import, and manage your commercial truck inventory. Build your commercial trucks into your Auction123 dashboard or let us import a file of your truck inventory from your website provider. As your inventory enters the system, enhancing your truck inventory with detailed specifications and features will be a snap. We can import commercial truck inventory from nearly any source that is able to send a file. Determine if you want us to get the raw data from your DMS; the images, descriptions, and videos within your current service provider; or drop us a file of your inventory via FTP. We can setup your automated import for as often as you need your inventory refreshed in our system. Manually building commercial truck inventory via the Auction123 dashboard ensures your listings will display detailed information beyond just the standard specifications. Our system presents a variety of options including information regarding the sleeper, DriveTrain, instrumentation, and more. 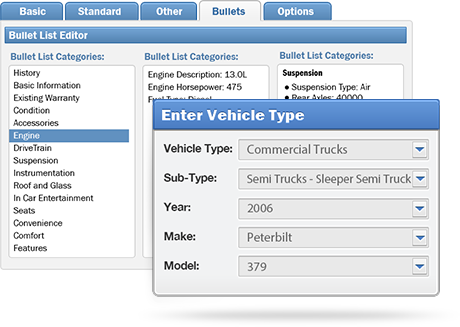 Just select the features of your inventory and your commercial truck listings will be rich with content on your units. The Auction123 system offers the best tools for importing and managing franchise and independent commercial truck dealer inventory. 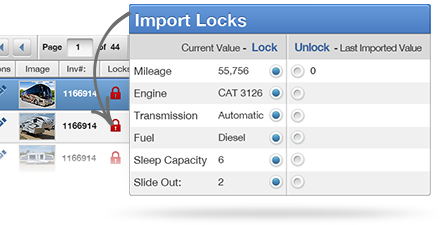 Our Field Level Locking controls let you edit and lock a data point on a vehicle (i.e. Internet price) while all other data points of the vehicle continue to update from the import. Revert to the imported value at any time by unlocking the data point. Having a sale on Freightliners? Our Bulk Actions system allows you to edit pricing (or revert changes) on your inventory. Our import features are the perfect match for Dealer Groups who require unique filters, splits, or combinations of inventory from one or many sources.